Hello crafty people! I love long cards and they are so difficult to find in the stores anymore. It seems every funny card that I ever loved and saved was a long length card. There is just something unique and different about them. I thought this shape would be interesting to make into a Valentine, so I gave it a go. 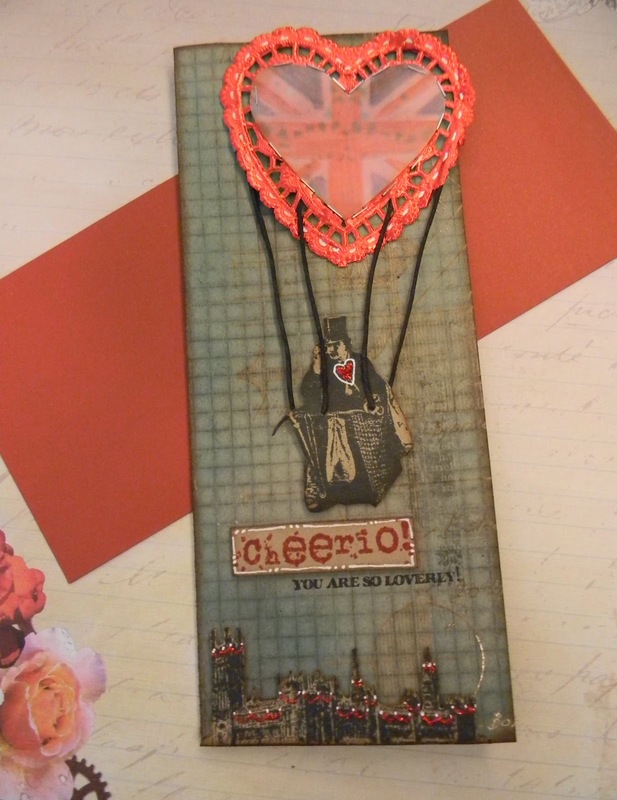 I made this card using three different sets of Artistic Outpost Stamps: London Underground, French Flight, and Loverly London. Their stamps really coordinate well together. Don't forget about their Monthly Referral Challenge for "shades of red". There is an awesome prize package giveaway that awaits a winner (yummy AO stamps and Tim goodies)! I have a friend across the pond (you know who you are) that I am sending this very English Valentine to. I hope she likes it. 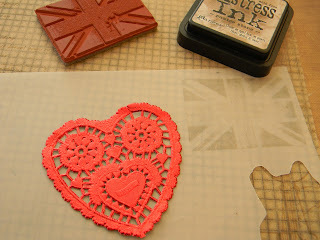 I am also submitting this to the Sunday Stamper challenge for "hearts", and the monthly challenge at Inspiration Journal for "put a heart on it". 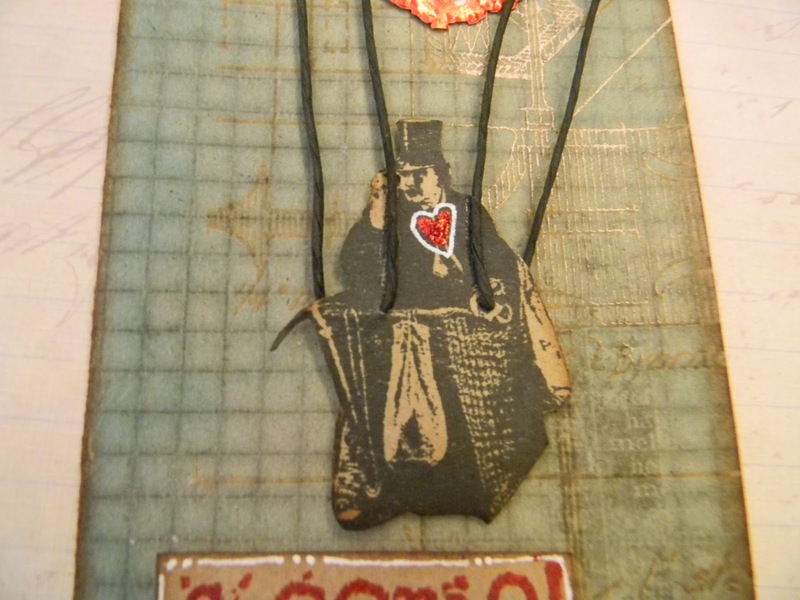 Shelly Hickox, a DT member for Inspiration Journal has a tag with a similar kind of balloon on it, but I promise I didn't blog-lift her idea. 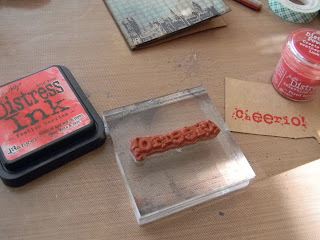 Great minds think alike sometimes when they have awesome stamps to use!!! I stamped the English flag image with Pumice Stone Distress Ink onto vellum, so the image would not be too dark for coloring, and the ink underneath would dissipate with water, as seen in the next photo. I used watercolor pencils to color in the image. I dried it with a heat gun, and cut it out in the shape of a heart, then gave it an edge inking with Gathered Twigs. 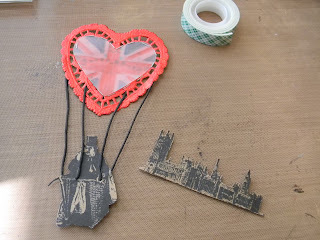 I stamped more images with Archival Ink onto kraft paper, and cut those out (leaving out the ropes on the balloon man). All the edges were inked with Gathered Twigs. 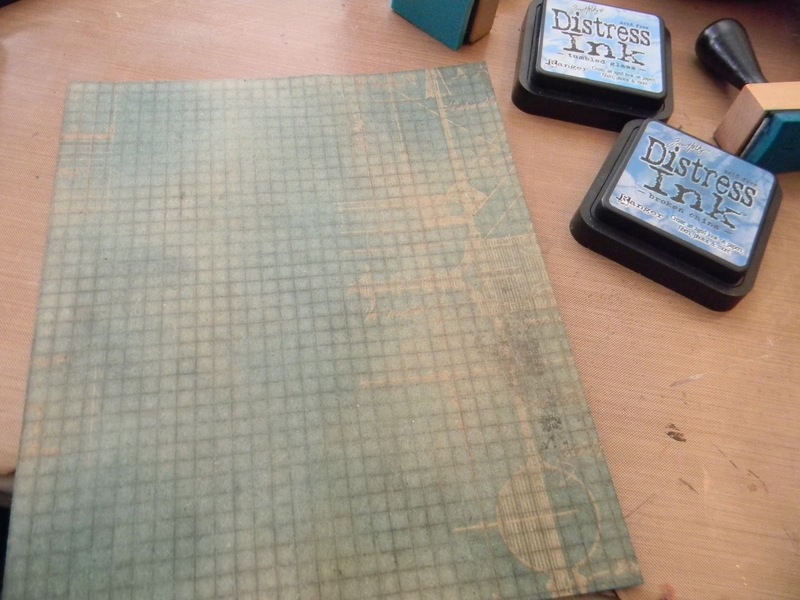 I cut a 7 1/2 by 8 1/4 inch piece of Tim's lined Kraft Resist Paper (love this stuff). I inked it with Tumbled Glass and Broken China Distress Inks. 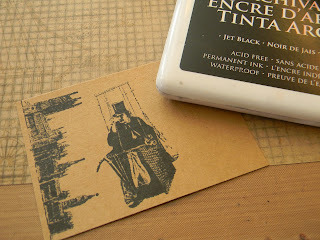 I wiped off the ink from the embossed resist images with a moist towelette. Then I folded the paper in half long ways, and inked the edges with Gathered Twigs. 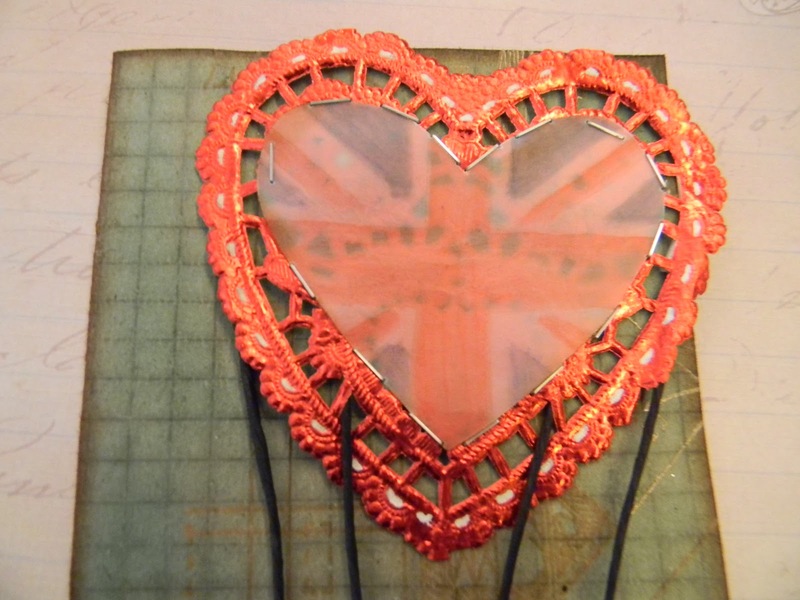 I attached the flag heart to the doily with the tiny attacher. I threaded the wire into the balloon basket and then into the doily and secured it. I adhered the images onto the card. I stamped the Cheerio sentiment onto kraft paper with Festive Berries Distress Ink and heat embossed it with Fired Brick Distress Embossing Powder. I cut that out and adhered it to the card. Then I stamped the other sentiment directly onto the card using Archival Ink in Jet Black. Finally, I used a white pen and Christmas Red Stickles to embellish a few of the images. Анита, ты просто чудо! Я в шоке от твоих работ! Anita, you're a miracle! I am shocked by your work! :::raising my hand::: Ohhh...I know who it's going to!! She's gonna Lurve it! As do I. Fun tag! Love the bling on the buildings and the bright red cheerio! I love it!!!! Thank you for playing along with the emporium!!! 'across the pond'will love it. Love this Anita - you're right, great minds do think alike, lol! 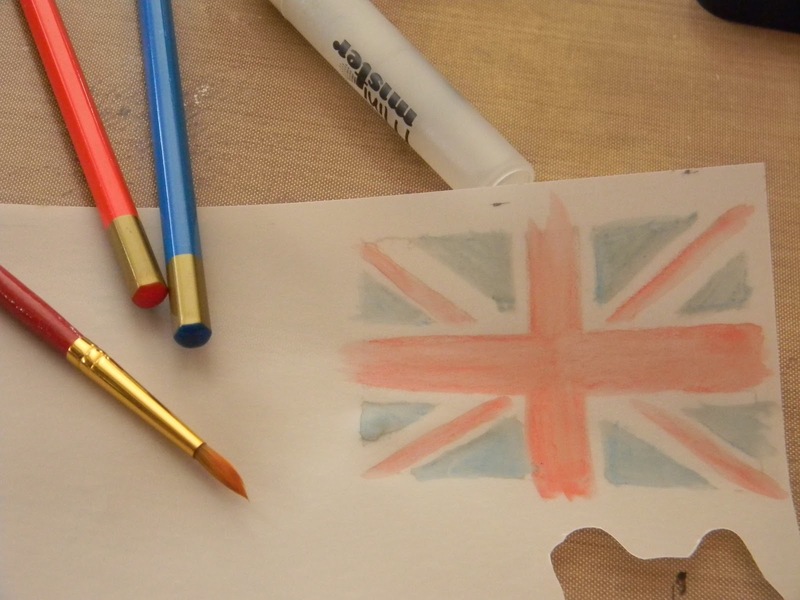 Your Union Jack heart is inspired! WoWzA, this is fabulous, Anita! An absolutely stunning piece of artwork~beautiful! 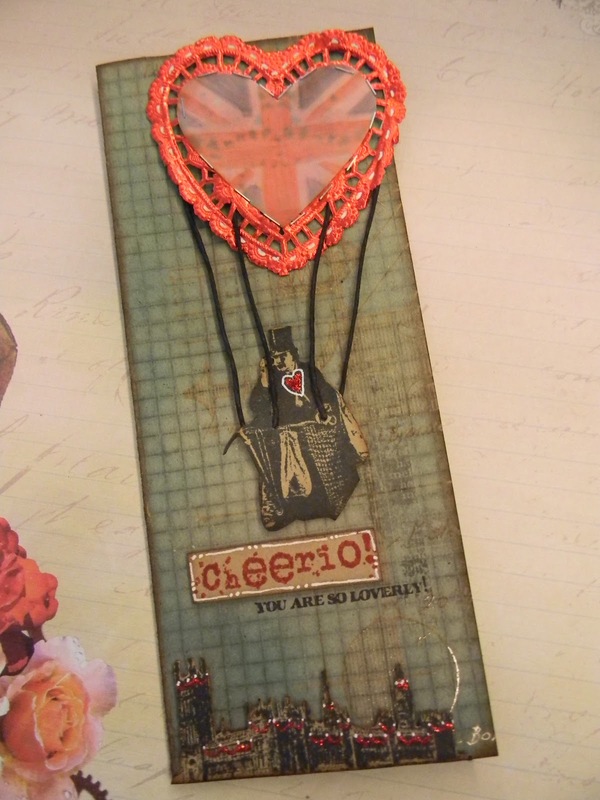 Good luck and thanks for joining us at The Artistic Stamper Creative Team Challenge. Very cool card! Love that english gentlement in his heart shaped english hot air balloon!! Really cool! 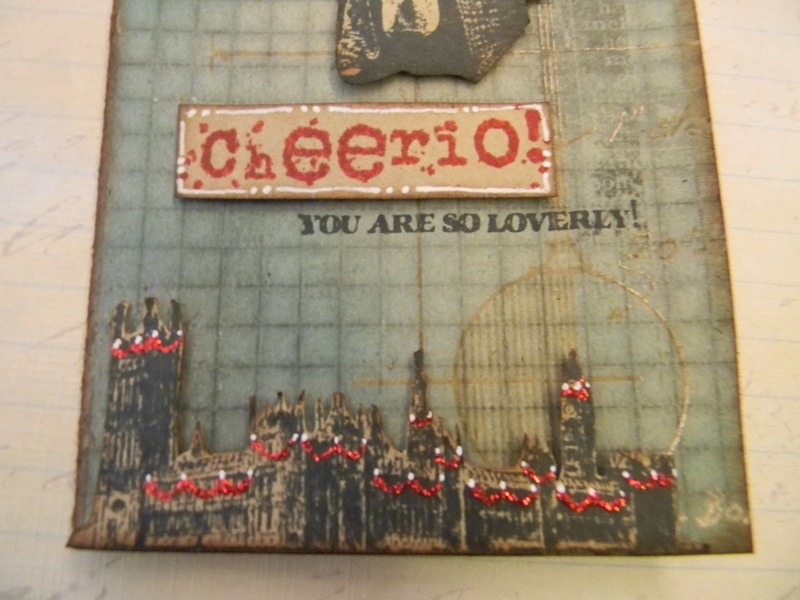 Fabulous card and I do love that garland trim on the city! Love is in the air! Fabby Valentine! London Towne looks wonderful all decked out for Valentine's Day! Great combination of AO images!